Japan is a country I have wanted to visit ever since…well since forever. Planning this trip was one of the most hastily organized excursions that I’ve had the pleasure of putting together, but it turned out to be a fantastic experience. For this exact reason I decided to write a complete travel guide to Japan that includes a sample itinerary and many many tips. I hope to make it easy for you to customize and make perfect your First Trip To Japan! In this article you’ll learn the most important things you should see and do on your first trip to Japan, but also the best way to travel around, the best time to visit, typical costs and lots more. FYI – this is a very long post, so grab a snack and get comfy if you’re staying for the whole thing! There are so many great things to do in the land of the rising sun, but so little time to accomplish them all! In order to experience the best the country has to offer, I recommend a full two weeks, at least. Touch down at Narita International airport…let the fun begin! Or not. Flying into Tokyo isn’t terrible, but it isn’t great either. Depending on where you’re coming from, you may also be terribly jet lagged. If that’s you and you’re on a 2-week schedule, consider an extra day to take it easy in Tokyo. Anyway, flights generally start arriving mid-day at Narita, so by the time you get through customs, immigration, and get your luggage, it is already afternoon. Once you get into the city, you can simply walk around in the vicinity of your hotel and still manage to have some fun. Oh, and unless you are super flush with ¥¥¥, your options for getting into Tokyo from Narita airport are basically the train or the airport limousine bus. If you’re lucky to find a hotel where the Airport Limousine bus stops at, take it. It will save you the madness of navigating Tokyo’s subway with your long-haul-flight hair and luggage. The seats are comfortable, and you get a chance for a quick nap. Win, win, win. Ohayou gozaimasu lovely! 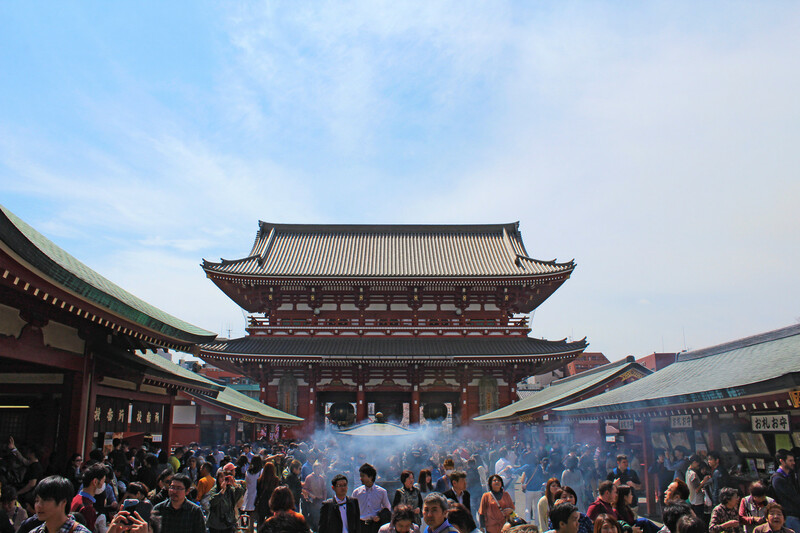 Start your day in Asakusa at Kaminarimon Gate, at the entrance to Sensoji Temple. 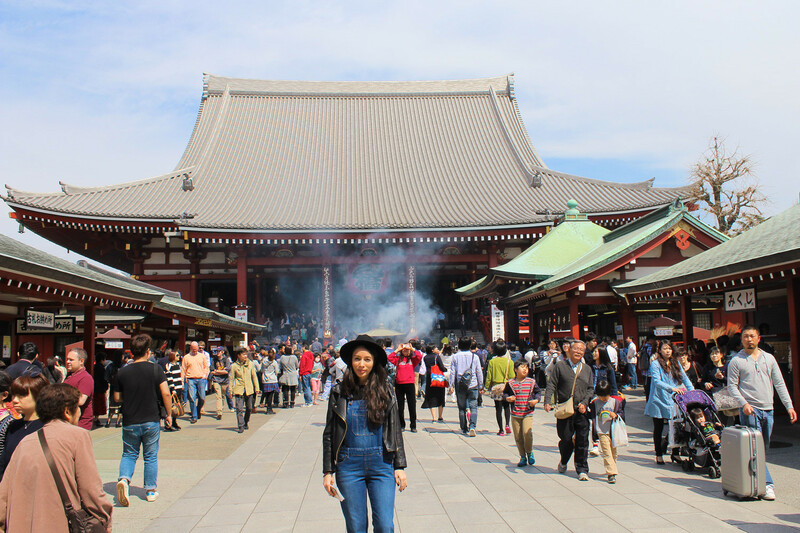 In a city full of temples, Sensoji is the eldest, boasting almost one and a half millennium of history. As you walk toward the temple buildings, check out the historic Nakamise Dorishopping street whose souvenir shops and food vendors have been serving temple visitors for centuries. There are various things to do at Sensoji besides visiting the main hall, like buying an Omikuji fortune or burning some incense in order to spiritually cleanse yourself. When you’re done, head to Sumida Park and board a lovely sightseeing boat to Hama Rikyu Garden. From here you can continue on to the Tokyo Skytree, the tallest tower in Japan. The complex has two observation decks with great views over the city. From here you can walk to Ueno Park, probably one of Japan’s most well known parks. Besides being parkish, it’s full of museums, shrines, temples, as well as the Ueno Zoo. Start the day by exploring Meiji Shrine. Take your time to walk around and to check out the history and design of the temple, as this is a great area to simply enjoy nature away from the hustle and bustle of Tokyo. When you’re satisfied, leave the shrine through its main gate next to Harajuku Station. 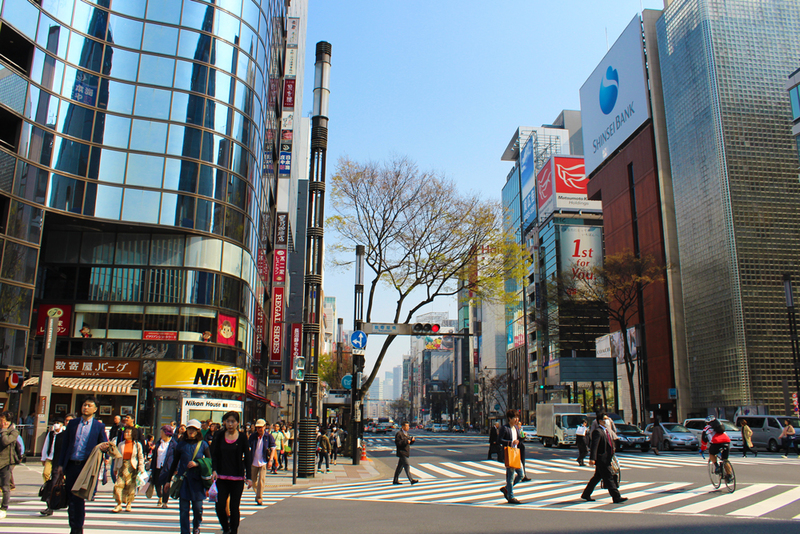 Cross the street in front of the station and explore the trendy shops and boutiques of Takeshita Dori Street. 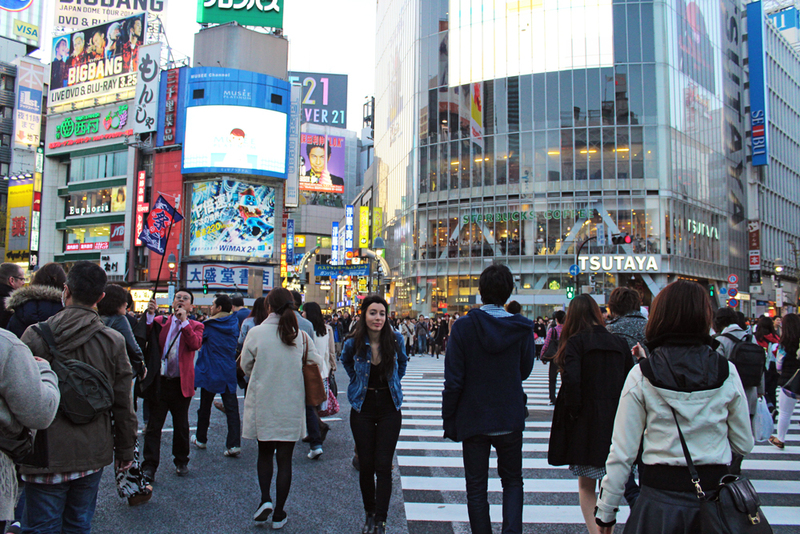 This is a great place for people-watching and shopping for wacky Japanese teen fashion. Head west past the Yoyogi National Stadium and turn south at the first light toward Shibuya. Continue south and turn right after the Parco Department Store down toward the Spain Slope, Tokyu Hands and Center Gai. Here you can check out the famous Shibuya Crossing and Hachiko Statue next to Shibuya Station. Around 8 or 9 pm you should walk to the Tokyo Metropolitan Government Building and head up to the observation deck, the view is just awesome. Besides, it’s free! Afterwards, I suggest you spend the rest of your evening getting smartly drunk with cheap drinks in Shinjuku. Hidden on a narrow grid of its side streets is Golden Gai, perhaps the most unique bar neighborhood in Asia. The tiny streets here feel more like Southeast Asia than Tokyo with roughly 200 bars built on top of each other. Hope you’re not hungover from last night, because it’s go time! Walk from Tokyo Station to the Imperial Palace. The Imperial Palace and Gardens is like Central Park, but with multiple palaces and a residing imperial family who live there. It’s also filled with lush, Zen-inducing vegetation and beautiful Japanese architecture. Exit the Imperial East Gardens via the Otemon Gate and head south past Nijubashi Bridge through the outer grounds to the Sakuradamon Gate. Cross the street and continue walking down the street to Hibiya Park. Pass through the park and continue southwest toward Ginza. 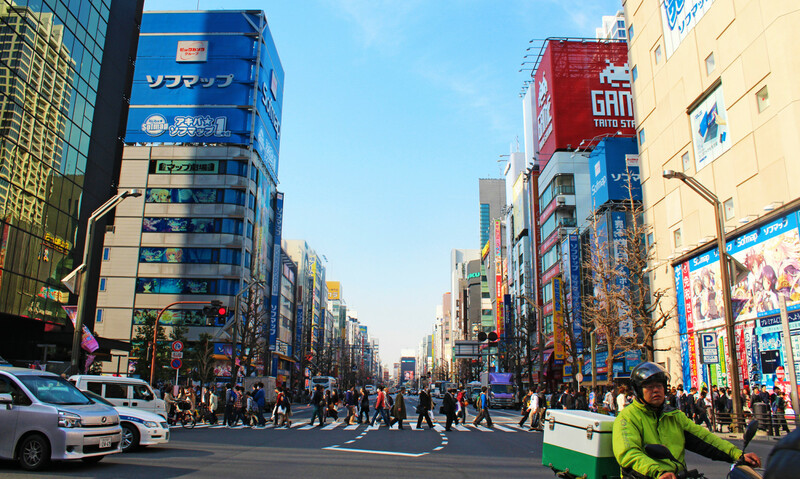 The whole Ginza is a shopping paradise with plenty of flagship stores to attract the attention of your wallet. It’s great place to admire modern buildings of famous brands, see the beautiful window displays and soak in the extravagance atmosphere. You should stay around until the neon lights and video displays come to life, lighting up the night with a whole new charm. With a filled stomach, you should be more than ready to get to Tokyo Tower. This is definitely one of Tokyo’s landmarks. 332 m tall, it is one of the highest freestanding steel towers in the world. It has two fully glazed viewing platforms – a double-storey platform at 150 m that also contains shops and restaurants and a single-storey one at 250 m.
Rise and shine little birdies! You’re going to start the day with a sushi breakfast at an awesome world-famous fish market, the Tsujiki Fish Market. If you want to see the tuna auction, which is free, you’ll need to get there by 4am (yep, you read that right), while the regular access starts at 9am. 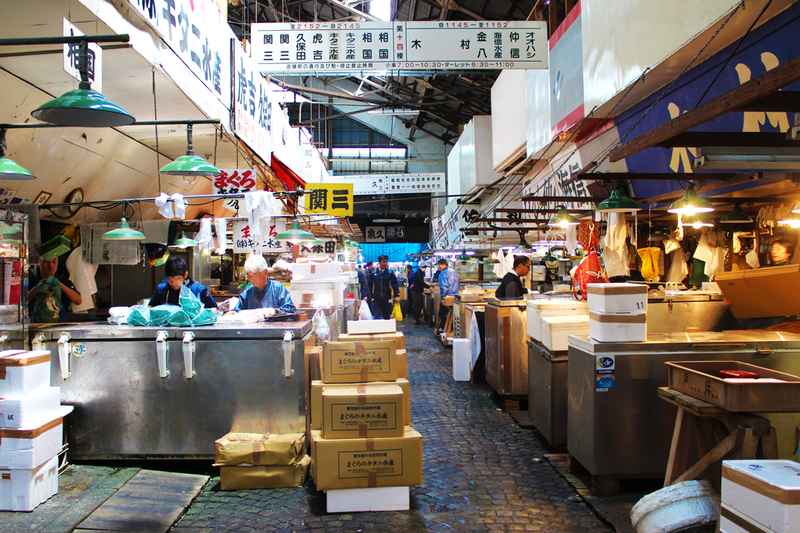 The Tsujiki Fish Market is one huge marketplace and is super busy with turret trucks running around. It’s hectic and crazy, but the food is just delicious! Anyway, when you’re done getting freaked out by googly-eyed fishes and seafood, find your way back to the train station and head to Odaiba. Odaiba is like the Atlantic City of Tokyo – plenty of malls, outdoor parks and recreational beaches. At night, some buildings light up synchronised with with blaring pop jingles from its speakers. You will be amazed at the amount of effort put into entertainment, even on their architecture and buildings! Nikko is the city found at the entrance to Nikko National Park, where you could easily spend several days discovering waterfalls, hot springs, and hiking trails. 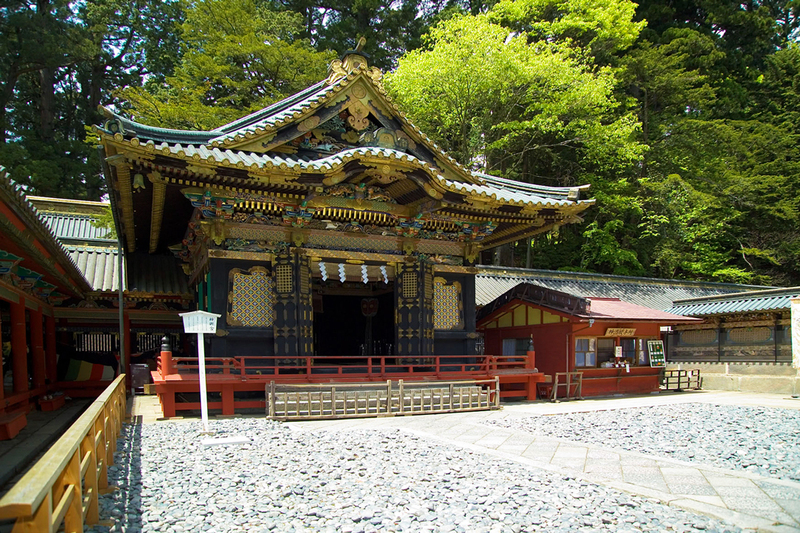 It’s also possible, however, to see Nikko’s UNESCO World Heritage temples and shrines in a day-trip from Tokyo. My favorite shrine is definitely Toshogu, one of the most elaborately decorated shrines in Japan, which is reached by following a long path lined by massive, centuries-old cedar trees. Even if you’ve already seen dozens of religious monuments during your trip, Toshogu is still completely remarkable. 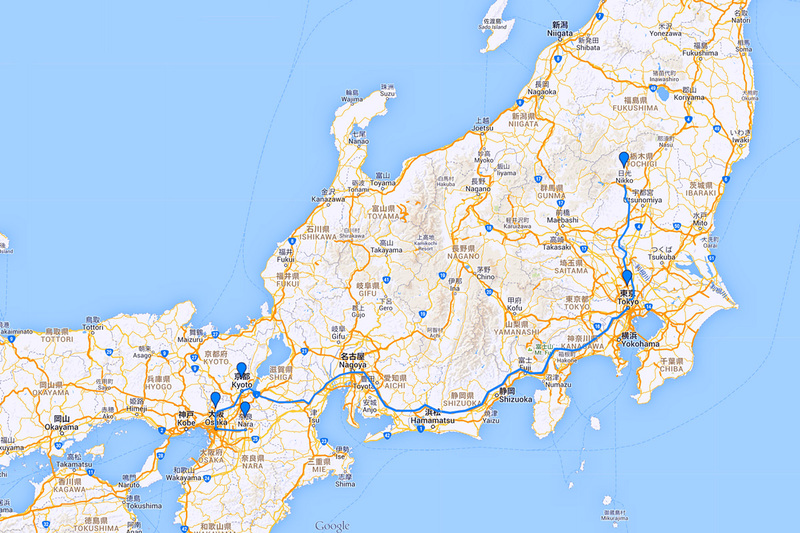 Nikko is easily accessible from Tokyo by train. If you have a JR Pass you can take a Shinkansen from Tokyo station to Utosonomiya, then transfer to the Nikko line and ride it to the final stop. Total journey time is around 90 minutes (Click here to search schedules). If you don’t have a JR Pass take the Tobu Nikko Line, which runs directly from Asakusa Station in northeast Tokyo (Click here to learn more about Tobu Nikko line prices and schedules). Leave for Osaka by Shinkansen, or the high-speed railway lines, a defining feature of Japanese of technology and innovation. From Tokyo to Osaka, it takes less than 3 hours by the Superexpress Nozomi train, part of the Shinkansen – it flies like a flash to your destination! I am by no means a railway fanatic but I have to admit that Japan’s bullet train is pretty great. I didn’t think one would notice much of going at over 300km/h (190-ish mph), but even in the completely sealed train the rush of speed is apparent. It also helps that Shinkansen trains look pretty badass. Take a stroll around the urban areas of Osaka. 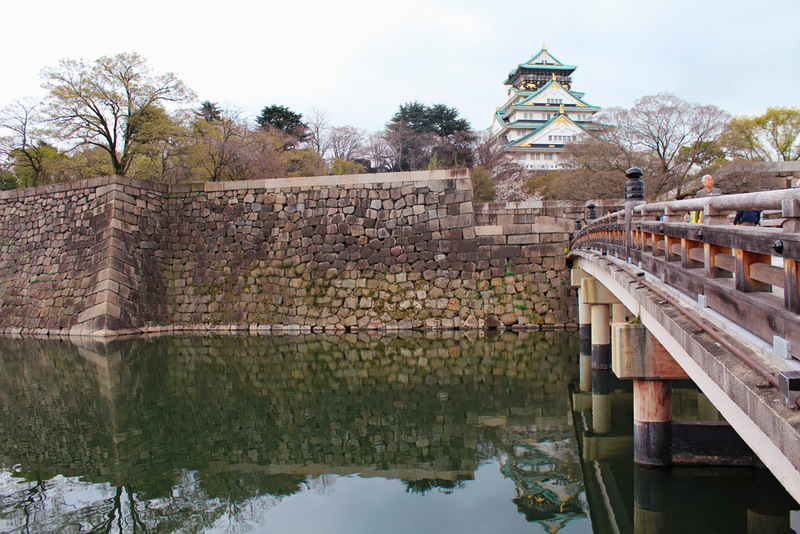 The city has been developed as the city of merchants, and overlooking it is the majestic Osaka castle. Osaka Castle is one of the most famous landmarks of Osaka, so famous that you would most probably see a picture of it on many tourism collaterals promoting the city. I suggest you go early in the morning to enjoy the nice walking weather. After the long (and quite tiring) walk at Osaka Castle, it’s time to have a glimpse at Osaka’s skyscrapers and urban side, so head to Umeda Sky Building. Famous for its unique architectural design, this 12th tallest building in Osaka is worth a visit if you love tall and modern structures. Traveling from Osaka to Kyoto takes only 30 minutes via the JR Kyoto Line from the JR Osaka station. Spend your first day taking in the beautiful scenery Kyoto has to offer. Kyoto’s going to be your shrine and temple time here in Japan, take your pick and enjoy! 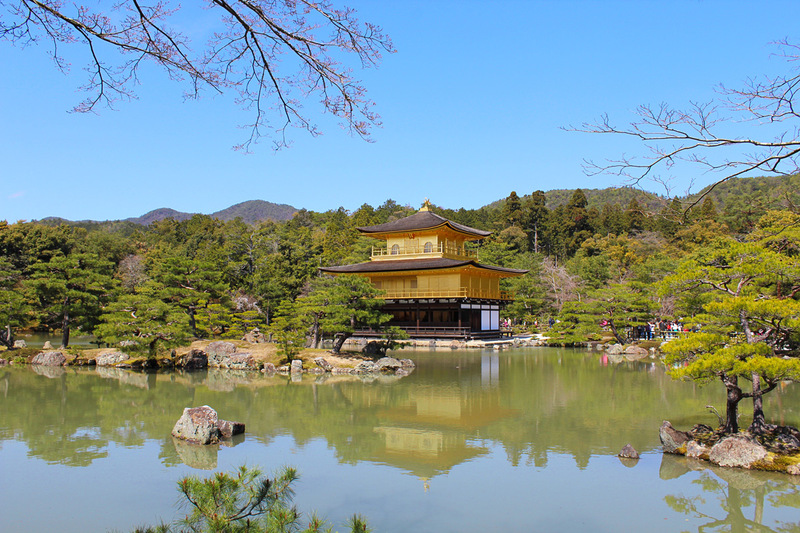 My personal favorite is definitely the Golden Pavilion. Also be sure to just walk around at random. Finish your first day by visiting some of the less known back-alley traditional restaurants and night clubs of Kyoto for an unforgettable experience. If you’re looking for a more in-depth guide to Kyoto – tips on where to eat and drink, where to stay – check out this very informative article by Journey Compass. In the western outskirts of Kyoto there is a popular tourist district called Arashiyama-Sagano. 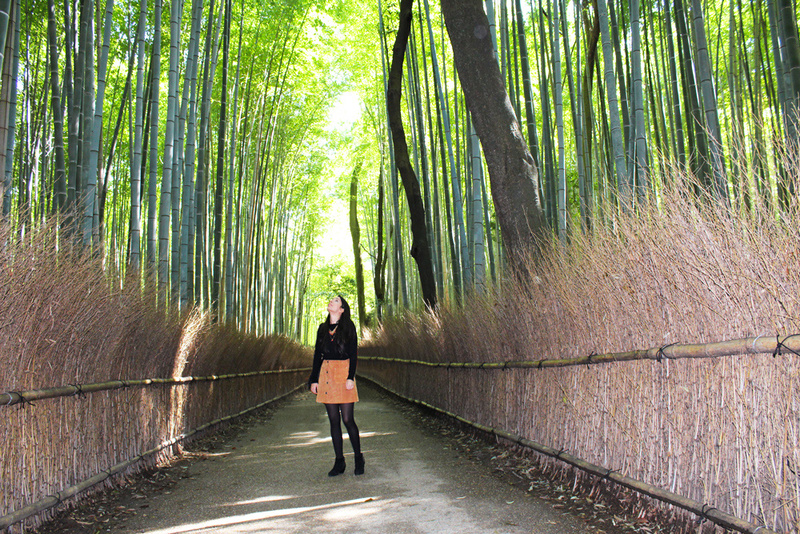 The big attraction in Arashiyama is its spectacular bamboo grove, one of the most beautiful natural environment in Japan. A walk along the paths that cut through the bamboo groves reveals Sagano in all its beauty. If you want to know more about Western Kyoto check out my post ‘Arashiyama-Sagano: A Walk Through Western Kyoto’. Perhaps the single most impressive sight in all of Kyoto, Fushimi-Inari-Taisha is the head shrine of Inari, located in Fushimi-ku. The shrine sits at the base of a mountain named Inari and includes trails up the mountain to many smaller shrines which span 4 km. It takes approximately 3.5 hours to walk up. If you want to know more about Fushimi Inari check out my post ‘Fushimi Inari Taisha: A Walk Through Southern Kyoto’. Hope you had fun in Japan! This is only your first trip, though. Now that you’ve gotten all the normal and main stuff out of the way, your next trip can be filled with strange and unusual places. WHEN TO GO: SPRING OR FALL? Spring in Japan is associated with cherry blossoms, that have captivated the hearts of the Japanese people since olden times. 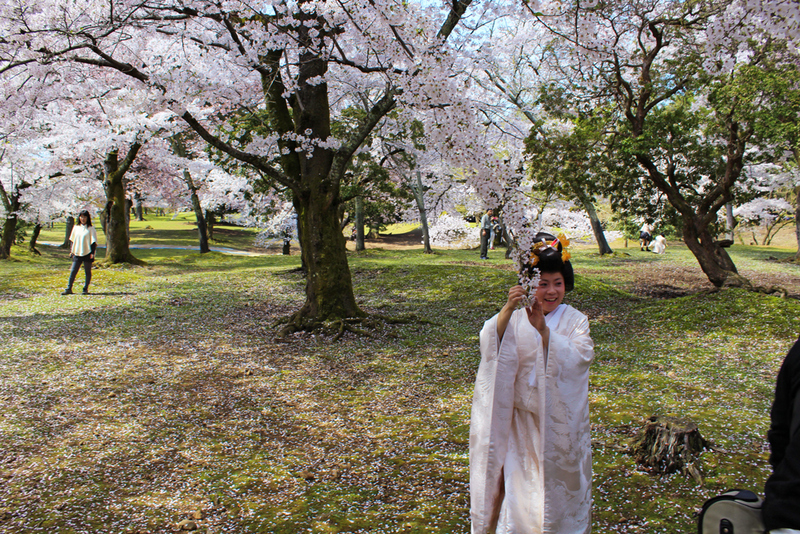 The traditional custom of hanami is to visit parks with cherry blossoms and hold sake-drinking parties beneath the cherry trees in full blossom, it’s lovely! 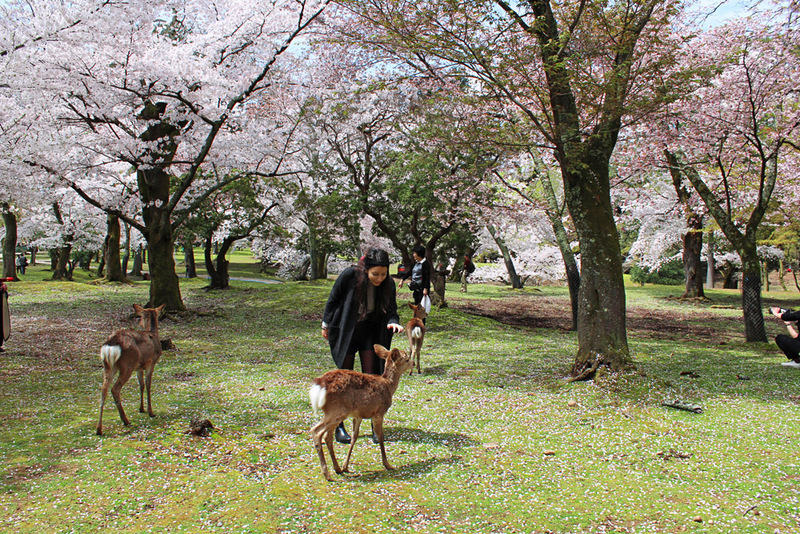 Tokyo’s Ueno Park and Nara Park are famous spots for viewing cherry blossoms. Autumn is also a great time to visit, as it evokes the beautifully colored leaves. In Kyoto, there are many temples with gardens where you can enjoy the beautiful autumnal foliage. The greatest charm of sightseeing in Japan is surely the seasonal change. Anyway, all the seasons have their good points. Sometimes it’s price, sometimes it’s the festivals, and sometimes it’s the weather. You’ll have to decide what’s the most important to you. No matter when you choose though, I’m sure you’ll have a great time! 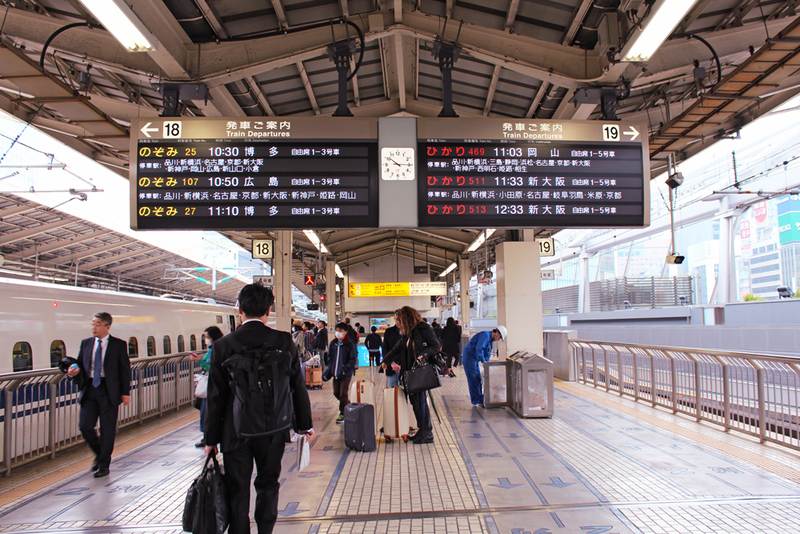 There is a lot of debate about whether purchasing a rail pass is the most cost effective option when traveling by train in Japan. Really, it all comes down to the amount of travel days you plan on taking during your trip. For this itinerary, the cheapest option is to purchase point to point tickets. If you’re thinking about getting a JR pass, keep in mind that you need to make a reservation from an approved reseller before arriving in Japan and then exchanging it for an actual pass once you arrive. If you are looking for the timetables of Shinkansen trains or major limited express trains, you can find them on JR Groups websites. Otherwise you can check the timetables on Hyperdia. It covers all railway lines and domestic flights schedule. This is the best website and help you build your itinerary. You can’t buy individual tickets online, so your only option is to buy them directly at the station. If you’re traveling during peak periods, perhaps it’s best to buy your tickets a few days before your selected departure date. Most stations also have automatic machines where you can quickly buy train tickets yourself. If you have a Japan Rail Pass, there is no need to buy a ticket or reserve your seat in advance, you can immediately board non-reserved cars. 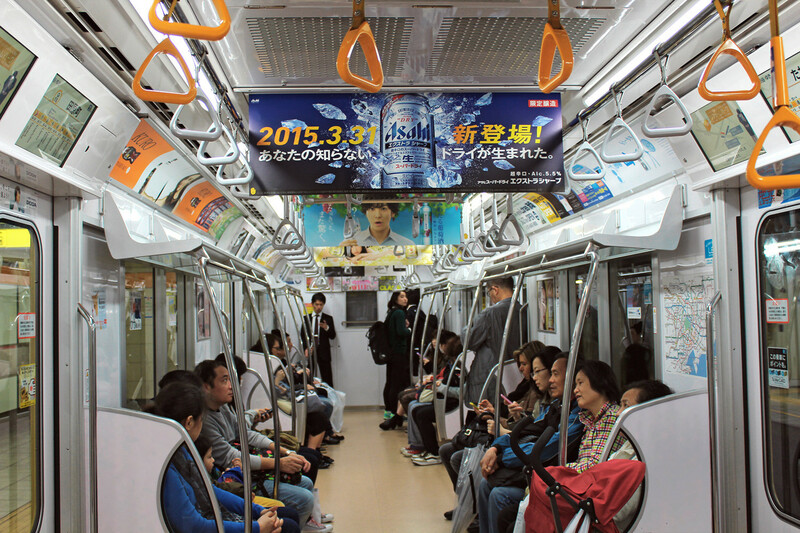 The subway lines and the JR train lines are the most convenient for moving around central Tokyo, Osaka or Kyoto. They’re spotless, quiet and nearly always on time. Japan has an image of being one of the most expensive countries in the world, and if you’re staying in fancy hotels, eating out, and traveling around a lot, it can be. You can easily spend over $200 USD per day by traveling that way. However, I don’t think a trip to Japan needs to be that expensive. Buying rail passes, eating relatively cheap food, and visiting a few attractions will cost around $100 USD per day. A 14-day trip would cost at least $1500 USD (plus flight & accomodation). Transportation in Japan is so freaking expensive. A train ticket from Osaka to Tokyo can cost around 20,000 JPY, and most of the city metro tickets cost 125-250 JPY for a single journey. In most major cities, you can buy a day pass, which gives you unlimited travel for 24 hours for around 1,000 JPY on select trains. Most temples and museums are free to enter, although some popular attractions cost around 1,250 JPY. 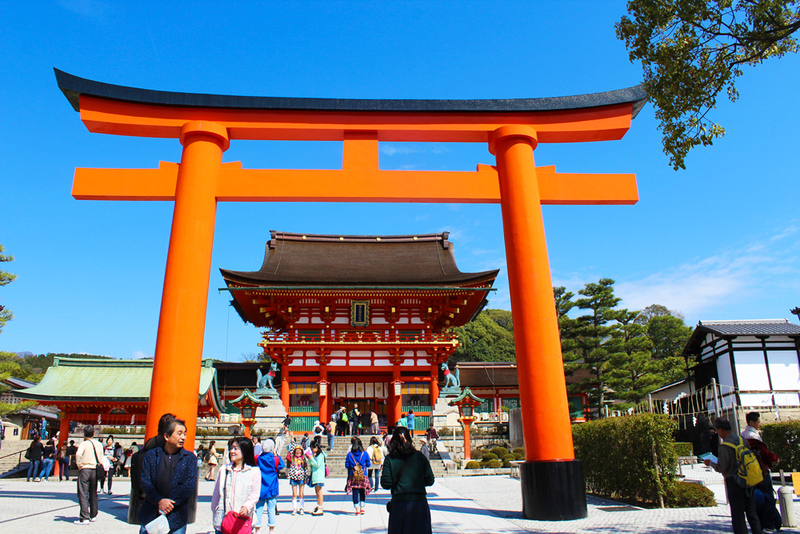 The temples in Kyoto can cost up to 620 JPY. Many of the city’s parks are free, so take advantage when you can and spend the day there. Surprisingly, I found food to be inexpensive in Japan. True, I have a sushi addiction, but overall, I found that I was spending far less than I’d anticipated. The fact is, there are many many great and cheap places to eat out in Japan! Most restaurant meals cost around 2,000 JPY. 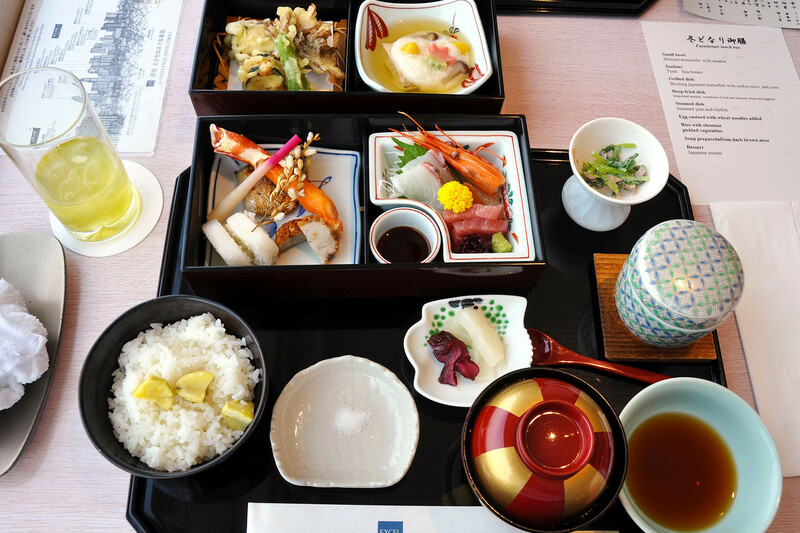 Mid-range restaurants can cost around 4,350 JPY. Sushi trains cost between 125-620 JPY per piece. Fast food is around 800 JPY. Correct manners are very important among the Japanese. Also as a foreigner in Japan you should be familiar with at least the most basic rules. Check them out here: Know Before You Go: Japanese Etiquette & Customs. It really helped to have our hotel names and addresses written in Japanese. All our hotel booking confirmations had the Japanese translations, so I would just hand the paper to the cab drivers and they would know where to go. There are many different types of accommodations in Japan. If you’re looking for something unique to Japan, try a capsule hotel. For a taste of Japanese culture, temple lodging or a traditional ryokan are the way to go. There are also budget-friendly business hotels, mid-range hotels and deluxe hotels. Hotel rooms are usually Western-style, maybe a little small, but plenty of amenities are usually provided including slippers, a robe or pajamas, soap, shampoo, combs and toothbrushes. Almost all hotels have free Wi-Fi available in the rooms. I know, traveling in Japan looks quite a challenge – the language barrier and the culture shock make it no easy place to visit, especially for independent and budget travelers – but let’s not forget the positive sides. You’re visiting one of the oldest countries in the history of our world. You’ll get to experience one of the most fascinating cultures that’s ever existed. You’ll feel like you’re stepping back in time and into the future at once. Everywhere you go, you’ll find some of the best cuisine known to man. You’ll have the opportunity to visit places so beautiful you’ll wonder if you’re actually in a dream! I really hope this sample itinerary for 2 weeks have helped you plan out your first trip to Japan.